Jiang Li, a Beckman Institute Graduate Fellow in the Cellular and Molecular Foundations of Intelligent Behavior Group, and Eric Scott Epstein, a Beckman Institute Graduate Fellow in the 3D Micro- and Nanosystems Group, present their research at the Graduate Student Seminar held at noon Wed., May 3, in Room 1005 Beckman. Lunch is provided. Reproductive endocrine disorders are major comorbidities of temporal lobe epilepsy (TLE) for both women and men. Our goal is to understand the mechanisms linking TLE and reproductive endocrine disorders. We recently demonstrated robust estrous cycle disruption in female mice in the intrahippocampal kainic acid (KA) model of TLE, suggesting changes in the neural control of reproduction. Here, we investigated changes in activity of gonadotropin-releasing hormone (GnRH) neurons in this model. We found that GnRH neuron mean firing rate increases significantly in the KA-treated female mice but not the male mice. This increase of firing rate is associated with the development of disrupted cycle, as KA-treated female mice with regular reproductive cycles maintained the normal level of GnRH neuron activity. We then performed spike pattern analysis for burst detection in the recorded GnRH neurons. 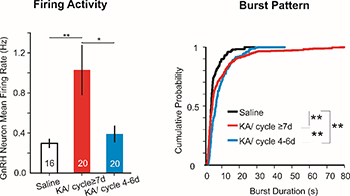 The burst duration and the number of spikes per burst were both increased in the KA-treated mice. Interestingly, the altered burst pattern was observed in female mice with/without disrupted reproductive cycle and also in male mice. Together, these results showed KA-induced epilepsy could affect GnRH neuron overall firing rate in females, and drive more subtle changes in burst patterns in males and females. In living organisms, biochemical processes are intimately linked to their environment through stimuli-responsive behavior. Photoreceptors in the eye convert electromagnetic energy into electrochemical impulses. ATP-driven molecular motors trigger muscle contraction, while voltage-activated ion channels regulate the flux of ions into and out of living cells. The chemistries that drive these biological processes are reversible and therefore cyclic in nature. They also serve a multifunctional purpose, both reacting to and triggering processes in their surrounding environment. Programming these characteristics into the chemistry of synthetic materials remains a major challenge. 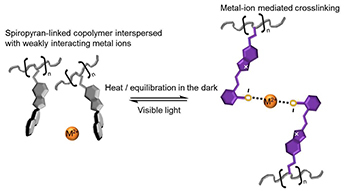 Supramolecular chemistries such as metal-ligand coordination complexes offer exciting potential for programming reversible reactions into synthetic polymers. However, one unique advantage of biological systems is the precision with which they trigger both the association and dissociation of dynamic bonds. I will introduce a strategy for using molecular switches to toggle the formation and dissociation of metal-ligand coordination crosslinks in synthetic polymers. We will explore how the underlying chemistry may be used to modulate the mechanical stiffness of materials in response to various environmental stimuli.